Have you ever been out on the river kayaking only to find you’re reluctant to stop at the end of an awesome day in the great outdoors? Well, my friend, it’s time you immersed yourself in a longer river trip and the sheer pleasure of kayak camping. Combining the river, wilderness, and campfire for several days kayaking off the beaten track – what’s not to love! Your canoe will take the weight of your camping essentials so you can focus on totally enjoying the paddling. And, at the end of each day, just pull up your kayak or fishing kayak and set up camp near to the river bank. Then rest back under the stars and look forward to another paddle blast with your friends. If this sounds like you, then now’s the time to embrace kayak camping. With some savvy prep and some nifty packing, you’ll soon be enjoying the joys of multi-days on the river. To get you started, we’ve put together Gear Hungry’s top 10 tips to a totally epic kayak camping trip. We all know the old adage ‘fail to plan, plan to fail’ and while we don’t want to sound like your old Scout troupe leader, preparation is key to a successful kayak camping trip. If this is going to be your first multi-night trip then don’t take on too much, one or two nights under canvas is the ideal way to start. And, if you’re new to kayaking, make sure there’s an experienced paddler as expedition leader. Your planned route also needs to be within your experience level. Yes, we all like a challenge but if you’re going to be out of your depth on a certain route, then you could be asking for trouble. 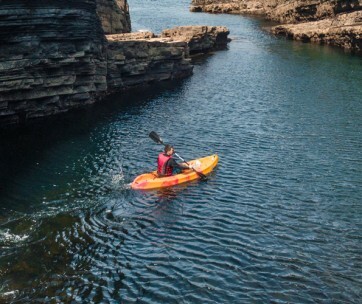 A multi-day trip is going to take you away from the beaten track and help may not be quickly available if there’s an issue mid-trip so go for a calmer water route if it’s your first time as kayaking camper. As well as your start and end point, you also need to work out how much paddling you will be doing each day and agree on the stop point where you’ll camp for the night. Take into account the topography of the river so you know each day is achievable and have a good basic understanding of how to read a map. This way you can work out how many miles you will paddle each day and can plan for daylight time on the water, as well as time for setting up and taking down camp. Once you and your paddler buds are happy with the plan, print out several copies: take one with you and leave one with a friend or family member. If you have gone cross country and are staying at lodgings or a campsite, leave your plan with the warden or nearest ranger station. This way, if something happens, your home base will know if you’re running way over time and put out an alert. And while we’re on the subject of ‘what ifs’, make sure personal safety is central to your planning and always wear your PDF (personal floatation device) when on the water. Trust us, the lifejacket tan lines are worth it. If this is your first-time kayak camping, then you need to be sure the canoe you plan to use is up to the job. The ideal camping kayak is one that can balance stability with speed, as you don’t want the weight of your gear to slow down your paddling too much or increase your risk of capsizing. 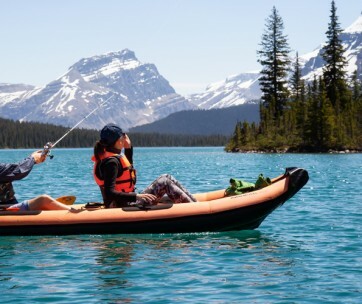 A good idea is to know the maximum weight bearing capacity for your kayak and ensure that the combined weight of you and your gear doesn’t tip it over the edge. This way you’ll get the boat stability you need to relax into your paddle; you don’t want to be constantly worrying about small movements flipping over your kayak. Adequate storage space is also essential, so use a kayak with storage options on the deck and inside the hull. And check that the material your kayak is made out of can easily cope with a multi-day trip. 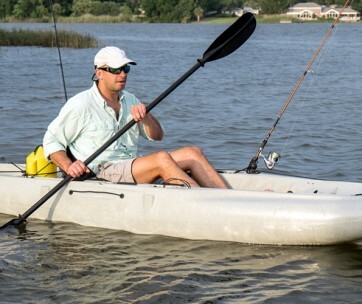 A lightweight plastic may be easier to transport and paddle but the hull may not be tough enough to weather repeated dragging over rough banks or rocky shallow water. 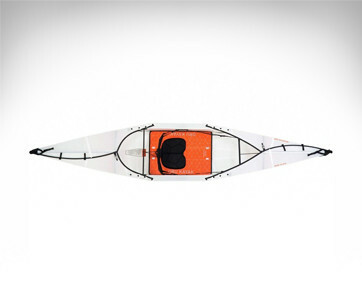 Wherever possible, opt for the most durable kayak for your camping trip. The last thing you want mid-trip in the wilderness is that sinking feeling. Kayak camping isn’t the time to bring everything but the kitchen sink, you need to be disciplined with your kit essentials. The first thing to do is chat with your fellow paddlers to make sure when it comes to kit such as a camping stove, camping coffee maker or GPS, you’re not doubling up. Draw up a list and then allocate out. Now, turn your attention to your own personal gear, in addition to the kit you will wear and use while out on the water. Can you sleep with just a lightweight sleeping bag (or hammock) or do you also need a small solo tent? Will you be taking your own supplies of water, or can you also make the most of water treatment tablets or water filters to save some space? Don’t forget your basic cookware; a plate, knife, fork, spoon, water bottle and camping mug will do. And leave space for your food – more on that later. You will also need a flashlight, lighter, sharp knife or a camping multi-tool. Keep clothing to a minimum, we suggest quick-drying base layers, waterproofs, sturdy footwear as well as your water shoes. Adapt your clothing to the time of year you’re paddling and include a travel towel. Maps, sunscreen, hat, sunglasses, first aid kit, sponges or bilge pump, insect repellent, compass and a basic kayak repair kit are all a given. A couple of bin bags and a roll of duct tape are also really handy. 5. Waterproof Hatches Aren’t Always! Water has a nasty habit of getting in anywhere you let it, especially if you’re out on the river for several days at a time. The compartments and ‘waterproof’ hatches in your kayak can keep out most of the water but throw in a capsize, a downpour or a stretch of white water and you’ll find it is impossible to stop some of it seeping in. To keep your gear dry, invest in several good dry bags in different sizes and pack well. Use smaller dry bags to squeeze in the space left by larger bags and you’ll be surprised how much you can pack in. For gear that you must keep dry – camera, firestarters, first aid kit for example, get yourself a dry box, which comes with watertight O-rings seals. How you load your kayak will make all the difference to your trip, not only in how your boat handles but also how quickly you can access your camping gear after an awesome day on the river. Think about where’s the best place to store all your gear and use the hull space, hatch and deck space wisely. You want to make sure your kayak is evenly balanced; too much weight at the ends will make it hard to maneuver while too much weight topside will make it unstable. A general guide is to keep the weight low and centered. Pack the heaviest items and stuff you won’t need to access until you stop for the night in the hull but space evenly. Use your top hatch for items you may need to access during the day on the river, such as the first aid kit, food, maps or GPS. Wherever possible, keep a clear deck. Gear stashed topside can become a hazard if the weather or water conditions change. Any absolute essentials such as your water bottle you hook under the deck bungees, make sure you also clip them on with a carabiner to keep them secure and less of a ‘stuff overboard’ worry. If you’re in any doubt, do a couple of packing dry runs before your trip so it becomes second nature. To be extra sure, take your packed kayak out on the water for a trial run so you can get a feel for the change in weight and see how well (or not) your boat handles. Better to find out before that it’s like trying to control a wild mustang than on the first day of the trip with no real option of turning back. If you’re planning an overnight kayak trip, you need to know where you can camp before you set off. To find out legitimate shoreline camping spots, check out the relevant park ranger or go online for private campsite opportunities en-route. Wherever you do overnight camp, always abide by the campsite rules or if wild camping, be mindful of private property and public land use rules. General camping rules also apply – extinguish any fires and aim to leave no trace when you move on. When setting up camp, don’t neglect your kayak in your keenness to put the kettle on. Pull your boat way up from the shore and flip it over for the night, to avoid it filling with rain if there’s a storm in the night. Also, tuck your paddles down the seat well and into the kayak for security – without your paddles, it’s trip over. Weather planning is a given for any kayaker but if you’re planning a multi-night trip it is crucial. For your first few kayak camping trips, aim to go mid-summer so you have a better chance of warmer, dry weather. But even on these trips, you must never be complacent when it comes to the impact weather can have on your plans. Your stretch of water could well be negatively affected by a weather front way up river, with a rise in water level or an unexpectedly rough white-water section suddenly scuppering your plans. Make sure you have a basic understanding of wind speeds, as well as monitoring weather forecasts before and during your trip. You’re better making a proactive adjustment to your kayak trip plans than having it forced on to you! Overnight weather monitoring is also essential. Even in summer, the nights are cooler, and the dark hours are when weather fronts can move in. Using all the weather information you can glean will not only enable you to pack the right gear and clothes but also keep you paddling safe and happy. 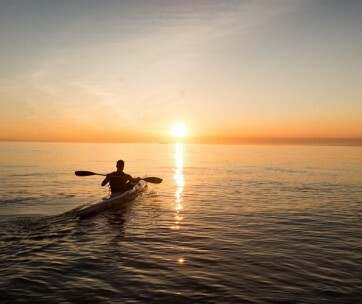 Even at a steady pace, you’ll be burning the calories if you’re paddling for long stretches so plan to eat well, both on the water and at the end of the day. As you are on the water, you could go totally wild and fish for your supper, or you could just pack everything you need. Kayak space is precious so you need to prep and pack enough food to last you the whole trip, based on the fact that you will most likely be burning around 2,500+ calories a day. Dehydrated food packs are a good option for your evening stopover as are packet soups, rice and noodles but when it comes to time on the water you need to think about fueling little and often. Go for high energy carbs, protein and good fats in snack packs, such as dehydrated fruit, protein trail mixes, energy bars and dried meat – all can be stashed easily into your top hatch for on the go access. 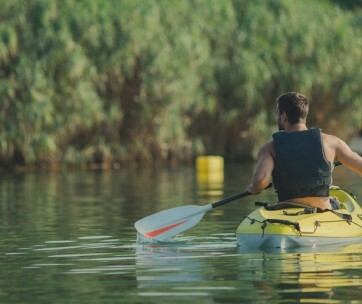 And don’t forget to drink – you’ll need at least two liters while on the water so ensure you pack enough on your kayak for the day’s paddling ahead. Make the most of the water filters you can buy to help to cut down on the volume of water you need to carry for the whole trip. At the very least, have some water purification tablets on board in case you run out of the fresh stuff. An essential detail of any kayak camping trip is the end. While out in the wet and wild you should be living and loving the moment, if there is no plan for the trip wrap up, you’ll soon lose all the feel-good. Nothing dampens the spirit than hanging around, wet and tired after an epic weekend, waiting to get home. As part of your initial plan, you should agree the pick up at the end of your route – you could leave a vehicle at the start and finish or you could get a kind friend to come and pick you up. The timing for your arrival is also important, as you need to not only plan your final day’s paddling, so you land in daylight but also factor in some extra time to keep everything safe in case you are starting to tire. With the end game planned for, you can now get on with the business of having a totally awesome kayak camping trip. Enjoy.